Dr. Johnson joined our practice in March 2013. She received her undergraduate degree in Human Resources Management from Louisiana Tech University in Ruston, Louisiana. She then completed her graduate degree from Louisiana Tech University in May 2011. She completed her fourth year residency at the ENT Center of Central Georgia in Macon, Georgia. Her interests are diagnostics and hearing aids in both children and adults. Dr. Johnson was born and raised in Colfax, LA. She enjoys spending time with her family and traveling. 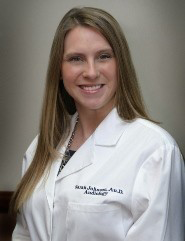 Dr. Johnson is a fellow member of the American Academy of Audiology and holds her Certificate of Clinical Competency with the American Speech-Language and Hearing Association.